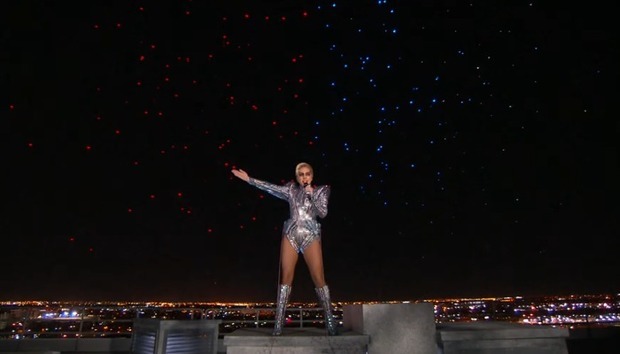 It wasn’t live, but Intel’s 300 drones in the sky behind Lady Gaga at the start of the Super Bowl Halftime Show were impressive nonetheless. What started out as a sea of floating lights came together by the end of the bit to form an American flag. It was impressive, cool, and it was all thanks to the ever-growing interest in drones. The Super Bowl was the third public outing in the U.S. for Intel’s Shooting Star quadcopter drones following several weeks of aerial shows at Disney World in Florida. It was also a record-breaking moment for Intel’s drones, which were allowed to fly up to 700 feet for the first time after receiving special permission from the Federal Aviation Authority. Each drone weighs a little less than a volleyball and is equipped with LED lights that Intel says can create more than 4 billion color combinations in the sky. To make the drones actually operate and move the way they need to, Intel said it developed special algorithms to automate the animation process. But during show time, the drones can be operated by a single pilot from one PC. Why this matters: Although Intel says the drones were designed specifically for entertainment purposes, there may also be more practical applications for these drones in the future. Intel’s drone chief, Anil Nanduri, told Wired that he sees a future where these drones could be used for purposes such as search and rescue. Just plug in a search pattern and off they go. Intel wasn’t the only company talking drones on Sunday. Amazon also aired a Super Bowl commercial showing off drone-based Prime Air deliveries. Prime Air is not yet available in the U.S., but it is currently being tested in the UK. Although Intel’s Shooting Star drones are able to show up for special events, the devices aren’t yet available for sale; the quadcopters still have to get a stamp of approval from the Federal Communications Commission. As US/China Tension Rises, What Fall-Out for Tech?